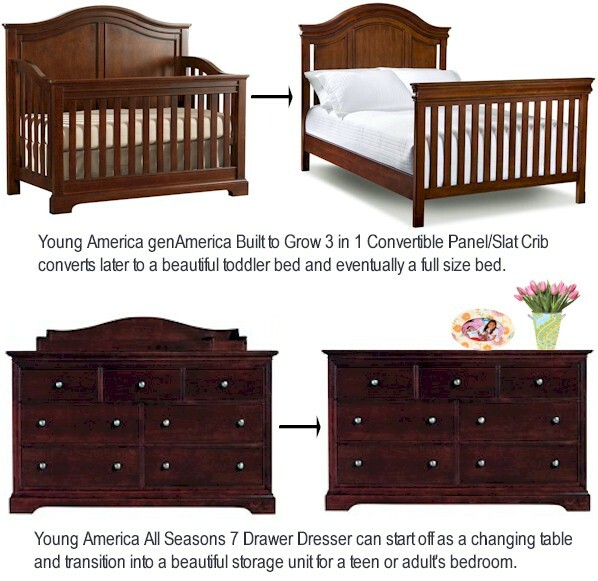 Young America Furniture isn’t just for kids… it spans all generations. This furniture is so well-built and stylish that it’s loved by everyone. Better yet, it’s also lifetime furniture, so you can use it in a baby’s nursery to start and then it will transition beautifully into big kid furniture when your child reaches the teens. Then when that same child is off to college you can move the furniture into a guest room and keep it forever. Don’t just take my word for it. Take a look at some of Young America’s transitional bedroom furniture to see for yourself. Below you’ll find the Young America genAmerica Built to Grow 3 in 1 Convertible Panel / Slat Crib that transitions beautifully into a full size bed in its final conversion. This allows it to go from nursery to big kid room with ease. You’ll also see the lovely Young America All Seasons 7 Drawer Dresser that starts as a stylish changing table and finishes as a gorgeous storage unit in a teen or adult’s bedroom. I’m sure you’ll find something you love from this popular brand! If you want to see all of the Young America Furniture collections please visit us at SimplyKidsFurniture.com today!